^ Palisca, Claude V.; Burkholder, J. Peter (1996). Norton Anthology of Western Music (3rd ed.). New York: W.W. Norton. p. 637. ISBN 9780393969061. OCLC 439757621. ^ Griffiths, Paul (1976). “Review of Threnody to the Victims of Hiroshima, Penderecki, K.”. The Musical Times 117 (1605): 915. doi:10.2307/958398. JSTOR 958398. https://doi.org/10.2307/958398. ^ Kozak, Mariusz (1 February 2017). 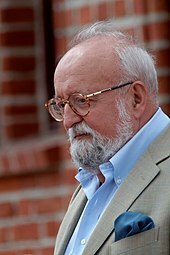 “Experiencing Structure in Penderecki’s Threnody: Analysis, Ear-Training, and Musical Understanding”. Music Theory Spectrum 38 (2): 200–217. doi:10.1093/mts/mtw015. ISSN 0195-6167. https://doi.org/10.1093/mts/mtw015. ^ Muir, John Kenneth (1998) (英語). Wes Craven: The Art of Horror. Jefferson: McFarland. p. 161. ISBN 9780786419234. OCLC 66655309. https://books.google.com/books?id=5u-i03aazJwC&lpg=PP1&pg=PA161#v=onepage&q=threnody&f=false. ^ Power, Martin (2012). Nailed to History: The Story of the Manic Street Preachers. London: Omnibus. ISBN 9781780381480. https://books.google.com/books?id=_jYDAwAAQBAJ&q=threnody#v=onepage&q=threnody&f=false.